✔ MENTAL & PHYSICAL STIMULATION OF PETS UNDER 30 lbs. --- Just fill it with your pet’s favorite small-sized snacks and toss it to them. Your cat, pug, schnauzer, schipperke, Welsh corgi, Yorkshire and Scottish terrier, Italian greyhound and others will love tossing and rolling the ball to get their snacks out - turning feeding time into an interactive playtime activity. It combines exercise with feeding to control your pet’s weight and them physically and at the same time, increase their IQ. ✔ STRONG, DURABLE, NON-TOXIC TREAT DISPENSER & IQ ENHANCER BALL --- In the pursuit of retrieving snacks from the ball, pet’s senses get stimulated as they roll it back and forth. The treats fall out from the toy as a reward to pet’s activeness, so this learning activity follows the positive reinforcement principle. Experienced Veterinarians recommend slow feeders to aid digestion and reduce bloating. Encourage your pet to play with treat ball as this allows them to eat in small portions. ✔ CLEAN PET’S TEETH HASSLE-FREE --- The ball is made keeping busy pet owners in mind. The benefit of this Challenging puzzle ball is that it cleans the pet’s teeth apart from offering unlimited fun. So if your pet is not comfortable with using a toothpaste or dental treat, this ball serves as an alternative that uses pet’s natural instincts to improve their dental health. This is also recommended for teething age puppy. 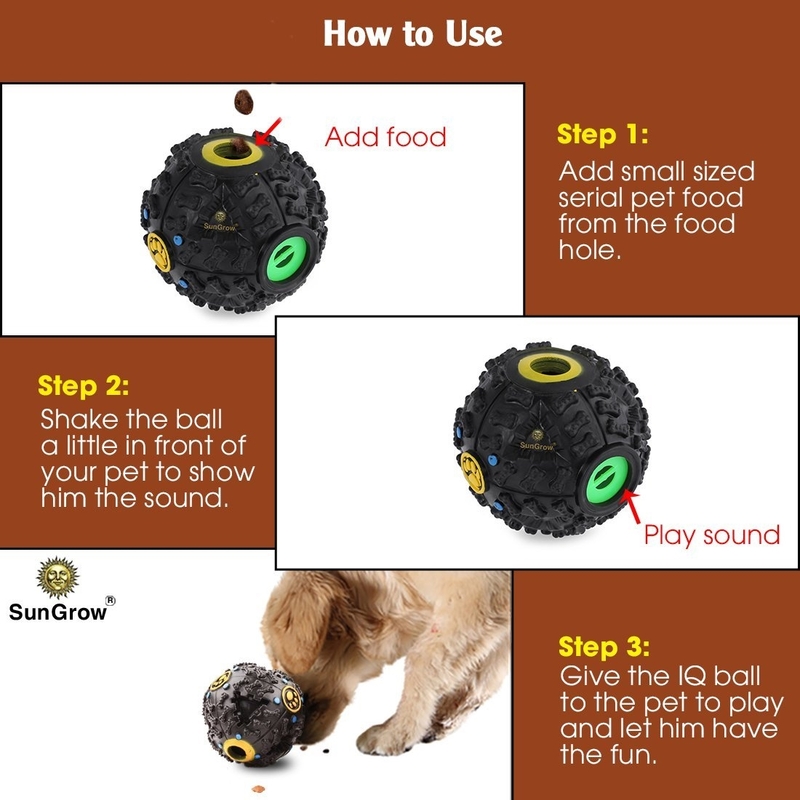 ✔ KEEPS YOUR PET ENTERTAINED FOR HOURS WHILE SAVING YOUR FURNITURE --- Your dogs and cats will have hours of fun getting the food, while hearing the cute squeaking sounds from rolling the SunGrow IQ Ball. It’s the perfect tool to use when you want to keep them busy and at the same time, help them fight obesity. Plus, save your furniture from the chewing damage as they go on the destruction spree due to boredom. 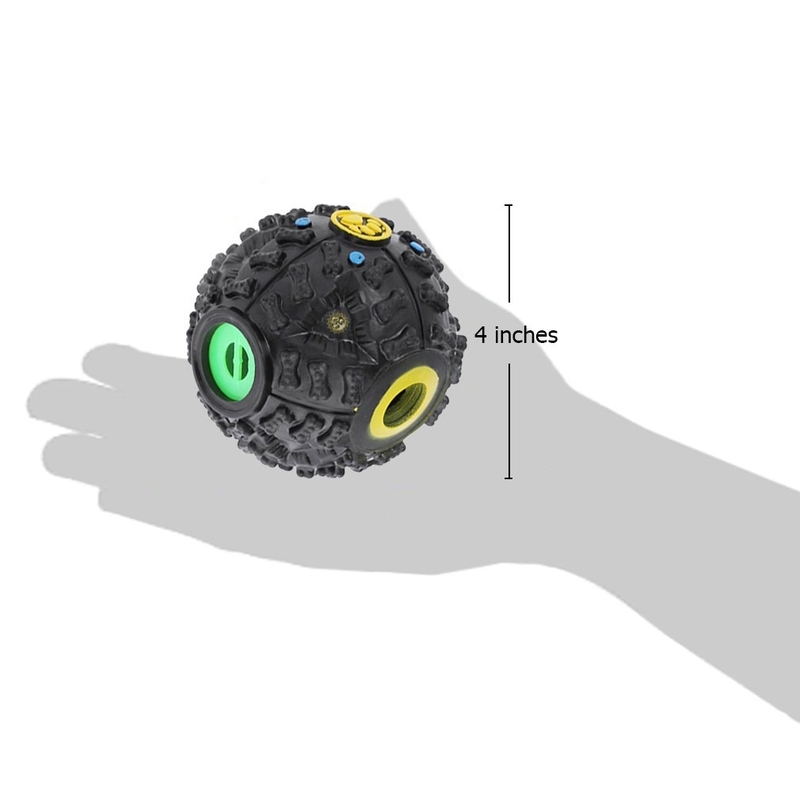 ✔ NO BATTERIES REQUIRED & BUILT TO LAST --- Please note that the SunGrow IQ Pet ball does not require any batteries. It is made from strong materials and no matter how notorious and active your furry friend is, this dog toy is practically indestructible.